Only 20 Characters Per Line. Size is NOT the height of the letters. Overall length only. Font Styles can be viewed below. Fonts to choose from. Due to the complexity of smaller Custom Text Decals there is a 20 character maximum per line. If you would like to have something customized please contact us. Also the size you choose is the overall width of the decal (All Text Combined) NOT the height of the letters. Thank you for your interest in our Custom Text Decal. 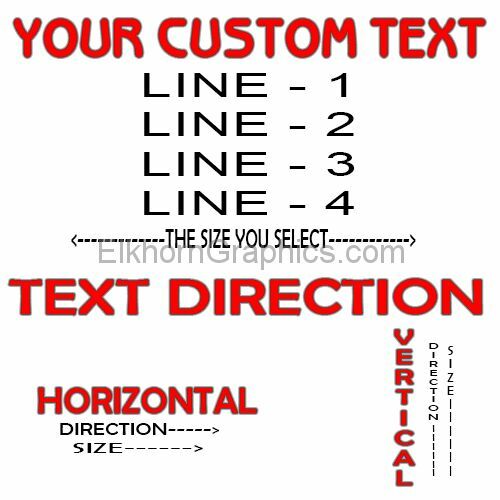 We offer the Custom Text Decal in a variety of colors and sizes. If you dont see the color choice or size you are looking for please give us a call. The Custom Text Decal will be cut from 5 year high quality Oracal 651 Vinyl. Being this decal is die-cut everything you see as black in the design will be the color you choose and all the white space is just that, empty space. (Nothing There) These are not your cheap printed decals with clear backgrounds. They are high precision die-cut with all the background removed by hand. We do not recommend Black as a color choice if you are placing your decals on a tinted window as it will not show up. Usually white, silver, and other bright colors are preferred. We warranty the Custom Text Decal for a full 5 years from date of purchase free from any peeling, cracking, or fading. This includes all basic colors. Specialty vinyl is warrantied for 3 years. (ie. carbon fiber, chrome, ultra metallic silver, diamond plate). We also offer bulk quantity discounts on all our decals even the Custom Text Decal. And if you are interested in a larger quantity than listed dont hesitate to call us for a quote. For more information on sizing and color please view other tabs above. Also please review the Installation Instructions before applying your Custom Text Decal. An instructions sheet will be provided with your order.